Below are some frequently asked dental questions that are asked by many patients. If you have any other questions, or would like to schedule an appointment, we would love to here from you. If you are looking for a veneers dentist in Stuart, Fl, look no further than the Stuart Dental Spa. Dental Veneers are generally done to protect a damaged tooth surface or for an aesthetic reason. Dental Veneers are perfect to correct a chipped, damaged, or stained tooth. They can also be used to give individuals who already have crowns on teeth a more natural and pleasant appearance. 2. What type of teeth whitening options are available to me? The Stuart Dental Spa offers three different teeth whitening options: KoR Teeth Whitening, Opalescence Whitening, and Sapphire Professional Whitening. KoR Teeth Whitening is one of the most effective teeth whitening systems, and Dr. Rita Medwid is one of only a handful of dentists that is certified to do this procedure. Opalescence Whitening reduced the discoloration of the enamel, making the teeth whiter. This is a popular choice because of the immediate results. Sapphire Professional Whitening is a safe and clinically proven to whiten teeth up to 12 shades in an hour. For teeth whitening in Stuart, contact the Stuart Dental Spa. 3. What are Teeth in a Day implants? With new dental technologies, you can have permanent dental implants within the course of one office visit! The Stuart Dental Spa offers one of the fastest cosmetic dental procedures, and Teeth in a Day gives you the same results as the traditional dental implants that take months to complete. 4. I have severe anxiety about visiting the dentist. Is there anything I can do? If you have anxiety about going to the dentist, you might want to think about sedation dentistry in Stuart. The Stuart Dental Spa offers sedation dentistry to patients who have dental anxiety, severe gag reflex, physical limitations, or a desire to have dentistry done more comfortably. 5. Is there a cheaper, more affordable alternative to braces? Six Month Smiles is a short-term orthodontics system. This technique involves the attest technology to help move your teeth in a quick, safe way. They re perfect for anyone looking to straighten their teeth without going through the rigors and expenses of traditional braces. 6. Can you tell me about dental implants? There are several options for dental implants, and they are getting more affordable. The most widely accepted and successful dental implant is the osseo-integrated implant, which forms a structural and functional connection between the living bone and the implant. 7. It makes sense to keep my family together at the same dentist. Is the Stuart Dental Spa a family dental office? The Stuart Dental Spa is proud to make family dentistry a priority. Our office is designed to promote a feeling of harmony. We want to get know each member of your family, and we want them to get know and trust us. Family dentistry experts recommend two visits a year for good dental health for everyone. 8. What are dental crowns and how do I know if I need them? There are a few different types of dental crowns, and they play a very important role in enhancing the looks of our teeth for a long time. The three different types of dental crowns include ceramic dental crowns, metal dental crowns, and porcelain dental crowns. 9. 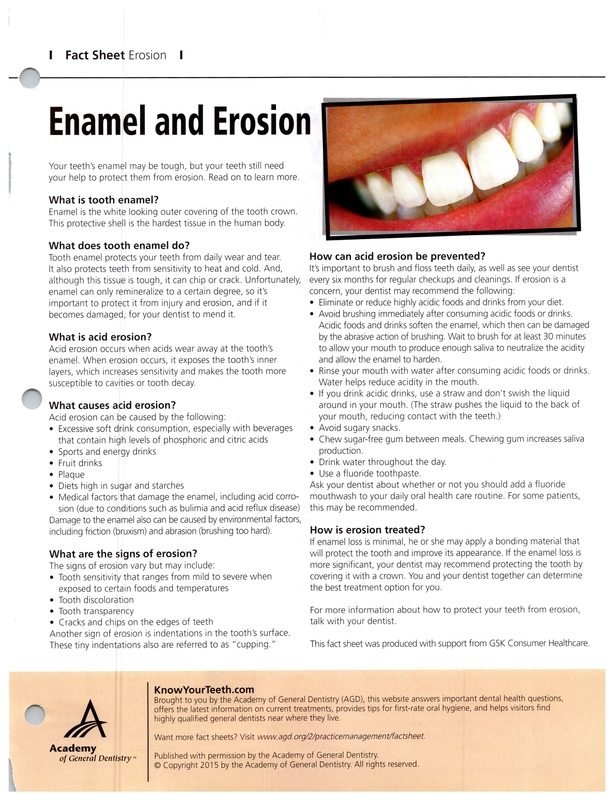 What is Enamel Erosion? Enamel is the substance that covers and protects your teeth, and it can be eroded due to various causes. Click here to learn more. 10. How do I make an appointment? Making an appointment for the Stuart Dental Spa is easy! You can schedule one in a few simple steps by filling out this form.